Erica Bunker | DIY Style! The Art of Cultivating a Stylish Wardrobe: I've taken the pledge! I Erica B., pledge that I shall abstain from the purchase of "new" manufactured items of clothing, for the period of 6 months. I pledge that shall refashion, renovate, recycle preloved items for myself with my own hands in fabric, yarn or other medium for the term of my contract. 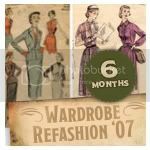 I pledge that I will share the love and post a photo of my refashioned, renovoated, recylcled, crafted or created item of clothing on the Wardrobe Refashion blog, so that others may share the joy that thy thriftyness brings!